Thin or thick film pressure sensors supply an output signal with 1…4 mv/V. To transfer this low sensor voltage to a standard signal 0…10 V or 4…20 mA a highly reinfording, stable signal electronics is needed. 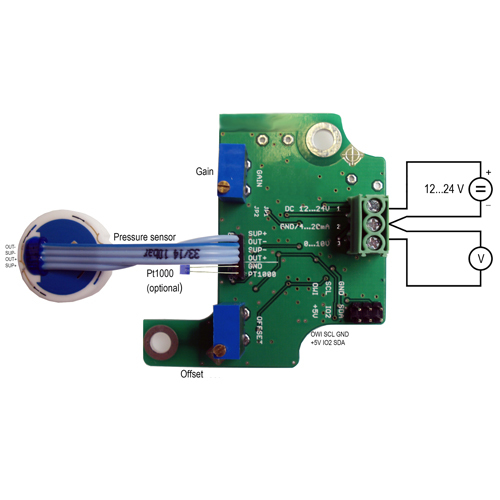 The universal evaluation electronics (measuring transducer) for pressure sensors transforms the difference bridge voltage (UB(p)) to a standard signal. The signal processing takes place digitally with an ASIC. Two potentiometers are available to set the zero point (Offeset) and the increase (gain) (linear transfer function). With suitable programming hardware and software the evaluation electronics can carry on being digitally adjusted to the desired pressure range. 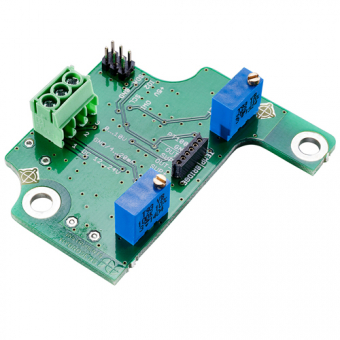 Polynominal functions up to third order are available, a temperature compensation of the pressure sensor is additionaly possible; for this purpose a Pt1000 sensor can be integrated.